This summer I saw Beyonce and Jay-Z perform live. This summer I went to BlogHer '14 where I saw Kerry Washington, partied with Rev. Run of Run DMC, and met Arianna Huffington. This summer I even hosted a blogging conference of my own. But despite all of this I still count simply reading Misty Copeland's memoir as a highlight of this season. 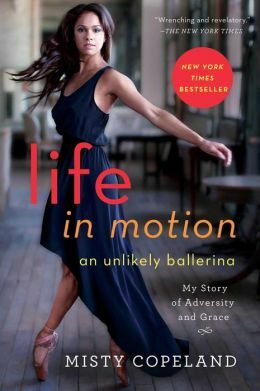 Her book Life in Motion: An Unlikely Ballerina tells the story of how she discovered and fell in love with dance and recounts her rise to become the third African American female soloist and the first in two decades at the American Ballet Theatre. The memoir details the struggles she faced and still faces in the world of ballet, a world that often told Copeland her skin was too brown and her body too shapely to be a true ballerina. The book gives readers a glimpse into Copeland's tumultuous childhood as well. But despite the fact that she and her family lived in a cheap motel room, despite the fact that Copeland started dancing at a much later age than most, and despite the discrimination she's faced due to her body type and race, today Copeland is one of ballet's most celebrated dancers. Misty Copeland is becoming a household name. Just last week her name was trending on Facebook after Under Armour sportswear released an ad staring Copeland. She's been criticized for this. She's been accused of being too hungry for publicity or just disparaged for "letting people in." But she stays true to her mission, nonetheless. And this mission of hers reminds me of blogging in so many ways. Blogging has taken the world of journalism and the world of literary arts and democratized them both. Sure, there is a down side. Sometimes amateur reporters get the facts wrong. Sometimes self-published authors don't bother hiring a good editor. But there is plenty of good that has come from the power and popularity of blogging, too. So many people, especially women, who once felt marginalized and disenfranchised now feel that they have a voice. Women who would have otherwise never gotten a book deal are now successful published authors because of their blogs. And because of blogging more women are getting the chance to pen reported pieces, essays, and commentary for major publications. I’m not a ballerina. But this clip shows how I feel when I write and blog – in a word, alive. This works every nerve and brain cell and muscle, it takes everything I have and promises nothing in return. Many times it frustrates me. But when just one sentence is right, or when one paragraph crystallizes a memory and holds it up to the light – well, there’s no feeling in the world like it. It’s what I’m meant to do. The slogan for the Under Armour campaign inspires me greatly: I will what I want. That's what Misty Copeland did. And as women writers and entrepreneurs, that's what we must do too. And you can do so one blog post at a time. I really want to read her memoir now! Someone else (can't remember who) recently said it was excellent, too. Yes, it is very good and you really learn a lot about the ballet world. Thanks for sharing! Because I live under the rock that is building my business and my boyfriend's business, I miss out on things like this. Misty Copeland's a big deal these days. I'm so glad she's becoming a household name. She deserves it. I forgot what made me start following her on instagram but she's awesome. Must get her memoir!.